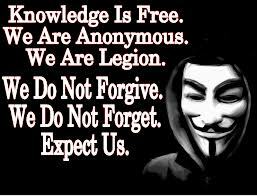 When seen online with a capital "A," Anonymous refers to a network of hacktivists. Their website describes the group as "an Internet gathering" with "a very loose and decentralized command structure that operates on ideas rather than directives". The group became known for a series of well-publicized hacks and distributed denial-of-service (DDoS) attacks on government, religious, and corporate websites, including the video on Church of Scientology below. Many say Anonymous is not as much a group as it is the manifestation of neuromance, William Gibson's vision come to life. When seen with a lowercase "a," anonymous means remaining unknown to the extent that you have not voluntarily identified yourself. On the Internet, computers are always identifiable because of IP addresses, so it's difficult to remain completely anonymous online. For anonymity, the best suggestion is not to give out your personal information online unless you really want to use a particular service or need something that requires you to divulge your personal information. For instance, it is not a good idea to voluntarily post on your personal Web site your home address along with pictures of your kids and where they go to school.